University of Basel within the Department of Sport, Exercise and Health Science under the lead of Prof. Dr.med. Arno Schmidt-Trucksäss. COmPLETE stands for CardiOPuLmonary Exercise TEsting. The COmPLETE-Project incorporates several research studies. The common goal of these studies, under the COmPLETE-Project, is to drive, advance and develop the cardiopulmonary exercise test as a diagnostic and prognostic tool. What about the cardiorespiratory fitness of the population living in the region of Basel? We are generating our own normal values and collecting data from 490 people between the ages of 20-100. We aim to better classify and evaluate your fitness and health status in the near future. Will we be able to detect heart failure and ischemic heart disease at an earlier stage and without invasive diagnostic methods? Data of cardiorespiratory fitness, as well as, vascular health and further health parameters will be investigated in 80 patients with heart failure and 80 patients with ischemic heart disease of all severity levels. This study will be initialised at a later time. 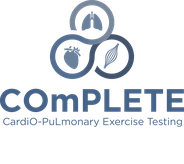 If you are interested in a research cooperation about cardiopulmonary exercise testing in COPD patients, please do not hesitate to contact us.